KSRealityBites: Magnetic Hill : Gravity at Play .. or .. Optical Illusion! Magnetic Hill : Gravity at Play .. or .. Optical Illusion! Can your car get a life of its own due to some unknown natural phenomena? It seems to be the case at the Magnetic Hill located 30 kilometers outside Leh on the way to Alchi & Kargil. Does anyone know about the Magnetic Hill? 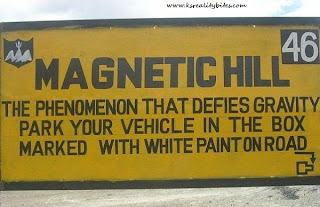 Have you been to Magnetic Hill? If not then no need to worry! Do read further to know more about it..
What is Magnetic Hill? 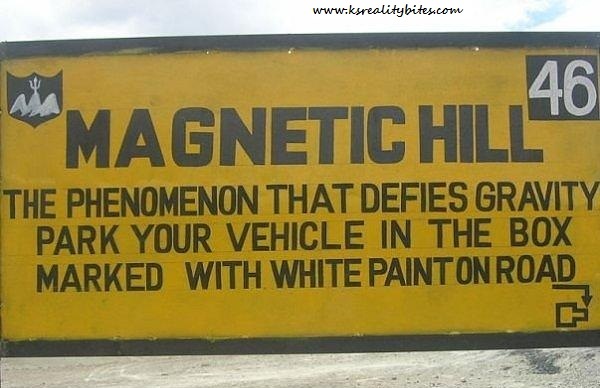 Magnetic Hill is a gravity hill located near Leh in Ladakh, India. The hill is alleged to 've magnetic properties strong enough to pull cars uphill & force passing aircraft to increase their altitude in order to escape magnetic interference; in reality, the effect is an optical illusion created by the gravity hill. The “magnetic hill” is located on the Leh-Kargil-Baltik national highway, about 30 kms from Leh, at a height of 14,000 feet above sea level. On its eastern side, flows the Sindhu, which originates in Tibet & goes to Pakistan. 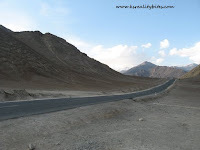 The hill is located on the Leh-Kargil-Batalik national highway, & is bordered by the Sindhu river. The Indian Army maintains a sikh Gurudwara near the hill where Guru Nanak Dev, the first of the Ten Gurus of Sikhism, meditated in the 15th century. Due to both the Gurudwara & the gravity hill, the area has become a popular sightseeing destination. A sign shown on the board, at this spot invites you to stop your car over a white square marked on the road, switch it off & leave it in neutral. Follow the instructions & your car actually starts moving on its own at speeds of 10-20 km/hr Ok, so this was downhill & it was just following the rules of gravity. Turn your car in the opposite direction & repeat the steps. It will start moving uphill. I heard of this phenomena & would wish to witness it to believe it in mere future. Even heavy car like the Scorpio overloaded with baggage & passengers are also effected. The heavy loaded trucks slow down their speed to below 20km/hr & due to this magnetic effect they need not accelerate their vehicles. It may not be as notorious as the Bermuda Triangle, but pilots play it safe by not flying any aircraft over Magnetic Hill according to an Army official. What happens to the law of conservation of energy here? Is this magnetic field a source of energy? Is there a way to tap it? Is there more of it available on the planet? Till you don’t find the answers, go to Magnetic Hill & give yourself a joyride! !